Ghana's new coach Avram Grant has named his first Black Stars' squad with an initial list of 31 players for January's Africa Cup of Nations finals. 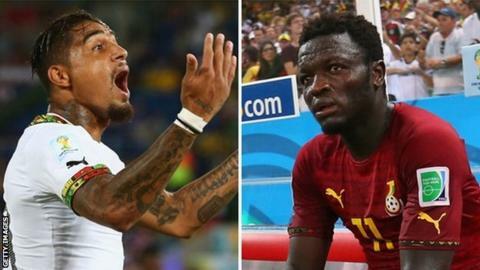 However there is no place for Sulley Muntari or Kevin-Prince Boateng, despite talk they maybe recalled after being sent home from the World Cup. Both are suspended indefinitely for gross misconduct while in Brazil. Muntari misses out despite having what Grant described as fruitful talks with the player. Shortly after being appointed as Ghana coach Grant had said: "The door is open for everybody, but there are criteria." However AC Milan midfielder Muntari is yet to apologise for the physical altercation with a management committee member that triggered his indefinite suspension. Muntari's AC Milan teammate Michael Essien is another player to miss out as does goalkeeper Adam Kwarasey. Kwarasey, who was part of the World Cup squad, is looking to build a new career in Major League Soccer in the USA with Portland Timbers following his recent move from Norway. The former Chelsea boss has stuck with many of those who helped Ghana qualify for the finals in Equatorial Guinea but has also recalled some familiar names . Samuel Inkoom, who recently signed for MLS side Houston Dynamos, and Middlesbrough's Albert Adomah are both back after missing out since the World Cup. Grant has also called up several new names including Frank Acheampong, whose performances for Anderlecht in the Champions League against Arsenal caught the eye. Arguably the biggest surprise on the list is striker Kwesi Appiah, who is on loan at Cambridge United in the fourth tier of English football from Crystal Palace. Ghana are yet to decide where they will train but are due to being their camp in the first week of January before Grant names his final 23 for the tournament.